b. 1673, 1st s. of Hon. Alexander Stanhope (yr. s. of Philip, 1st Earl of Chesterfield) by Katherine, da. of Arnold Burghill of Thinghill Parva, Herefs. educ. Trinity, Oxf. 1688. m. 24 Feb. 1713, Lucy, yr. da. of Thomas Pitt of Blandford, Dorset, 3s. 4da. cr. Visct. 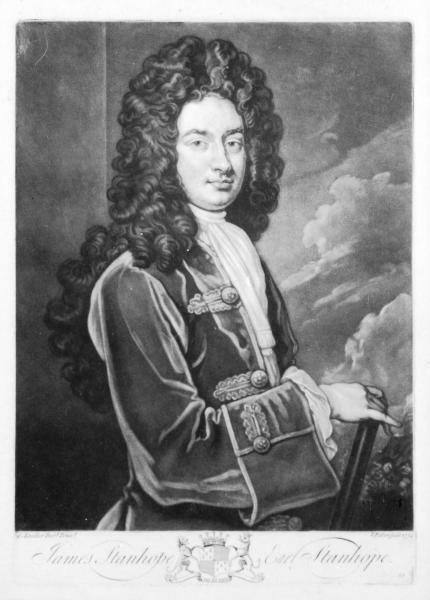 Stanhope of Mahon 3 July 1717; Earl Stanhope 14 Apr. 1718. A.-d.-c. to Duke of Schomberg in service of Savoy 1691, sgt. 1692, capt. 1693; capt. 28 Ft. 1694; capt. and lt.-col. 1 Ft. Gds. 1695; second sec. to Paris embassy 1698 and sec. to his fa. at The Hague 1700-1; col. 11 Ft. 1702-5; brig.-gen. 1704; envoy extraordinary to Charles III of Spain May 1706-Dec. 1707, May 1708-Dec. 1710; maj.-gen. 1707; c.-in-c. of British forces in Spain Mar. 1708-Dec. 1710, when he was forced to capitulate at Brihuega; lt.-gen. 1709; col. regt. of Drags. 1710-12; sec. of state, southern dept. Sept. 1714-Dec. 1716, northern dept. Dec. 1716-Apr. 1717, Mar. 1718-d.; P.C. 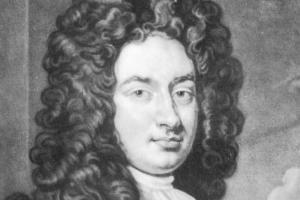 29 Sept. 1714; ambassador to Vienna Nov.-Dec. 1714; first ld. of Treasury and chancellor of the Exchequer Apr. 1717-Mar. 1718; ambassador to Paris and Madrid June-Sept. 1718, to Paris, Jan. and Mar.-Apr. 1720, and to Berlin July 1720; one of the lds. justices of the realm May-Nov. 1719, June-Nov. 1720.
knowing indeed that he had a fruitful and luxurious genius in foreign affairs, which I hoped he would have suffered to be checked and pruned by Lord Townshend’s prudence, but I never imagined that he would have proved wild, mad, and ungrateful. My heart is so full with the thoughts of having received this treatment from you, to whom I have always been so faithful a friend, that you will excuse my not saying more at this time. I pray God forgive you; I do. What could prevail on you to enter into such a scheme as this, and appear to be chief actor in it, and undertake to carry it through in all events, without which it could not have been undertaken, is unaccountable. I do swear to you that Lord Townshend has no way deserved it of you ... Believe me, Stanhope, he never thought you could enter into a combination with his enemies against him. he ingenuously owned his incapacity for the affairs of the Treasury, which were so remote from his studies and inclination that therefore he would fain have kept the employment he had before, which was both more easy and more profitable to him; but he thought it his duty to obey the King’s commands. he would endeavour to make up by application, honesty, and disinterestedness what he wanted in abilities and experience. That he would content himself with the salary and lawful perquisites of his office; and, though he had quitted a better place, he would not quarter himself upon anybody to make it up; that he had no brothers, nor other relations, to provide for; and that upon his first entering into the Treasury he had made a standing order against the late practice of granting reversions of places. These remarks led to an altercation so violent that to prevent a duel the House passed a resolution forbidding the two statesmen to carry the dispute further. 1. St. Simon, Mems. (ed. Boislisle) xviii. 50; B. Williams, Stanhope, 154. 2. Coxe, Walpole, ii. 48, 143-6. 3. ‘Account of the court of Geo. I’, by Edward Wortley Montagu, in Letters of Lady Mary Wortley Montagu (1887), i. 18-19. 4. Coxe, ii. 126, 143-6, 148; HMC Stuart, iii. 447. 5. Williams, 439-45; HMC Portland, v. 616.